inspired by a discussion via PM with a few guys we have decided to start a thread for our RC Mokes. All started last year with publishing my Moke model website and presenting the RC shell of Christoph Hoffmann. A few Mokers asked if they are still available and meanwhile we got another 5 shells which we want to build up for a race at the IMMM 2013 in Luxembourg "The Luxembourg Moke GP". 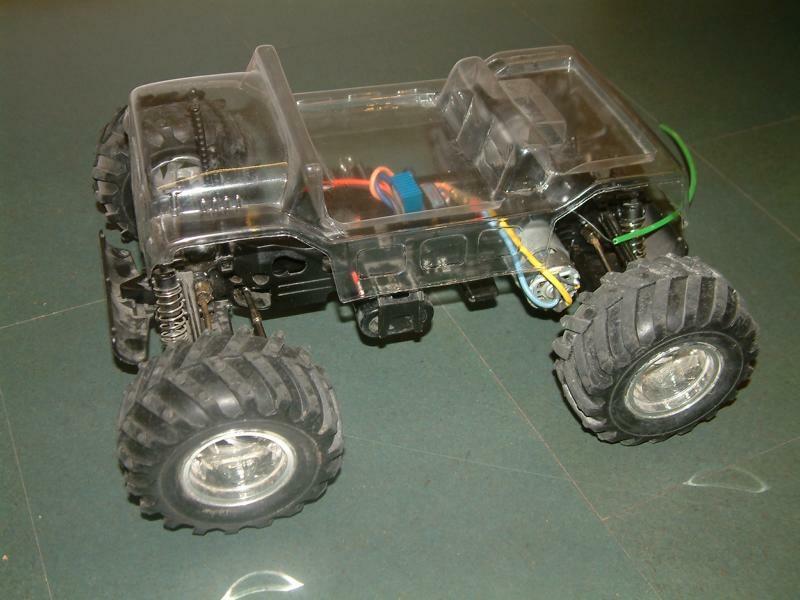 We are also looking for other RC Mokes in the world! 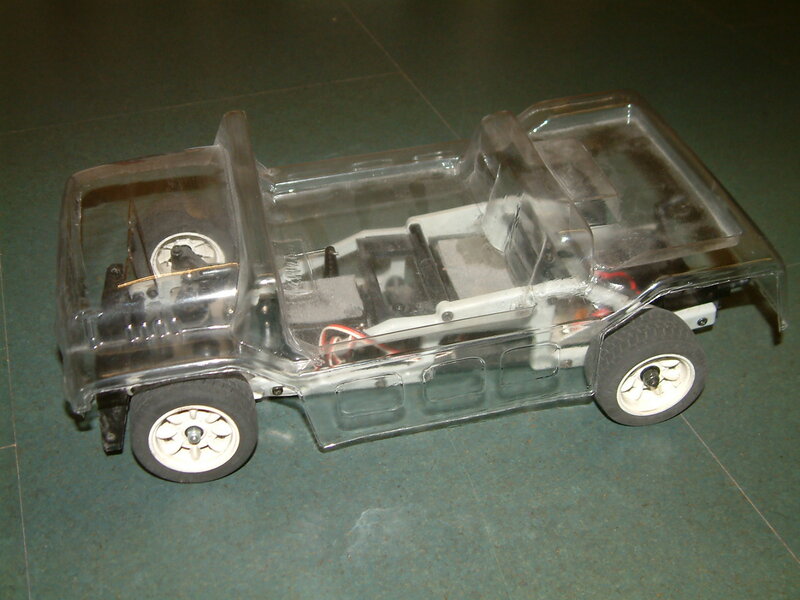 I got my shell a few years ago as a birthday present but did not had a fitting chassis. 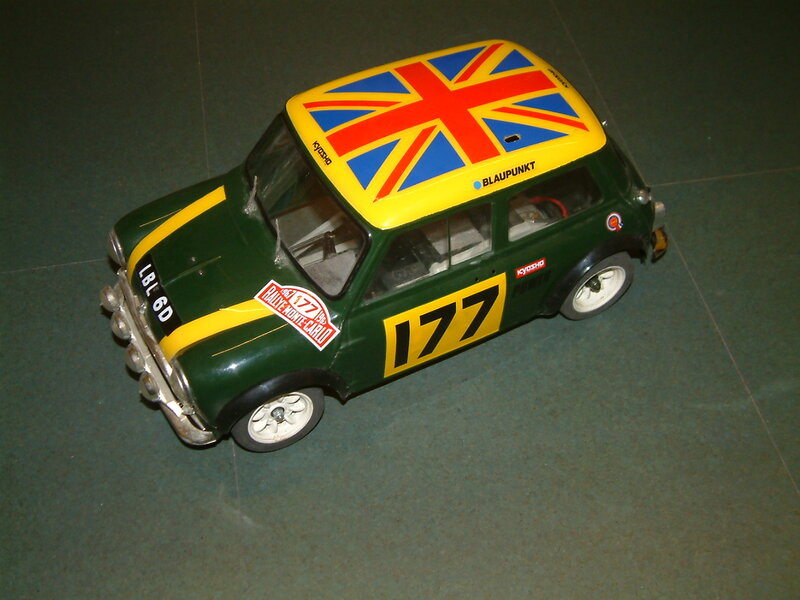 That changed last autumn when I saw a Kyosho Mini Cooper at a parts market. It looks like I have to cut out a piece of the shell but I donÂ´t like to do that. Maybe the Tamiya M-chassis fits better. Most people have used that one. 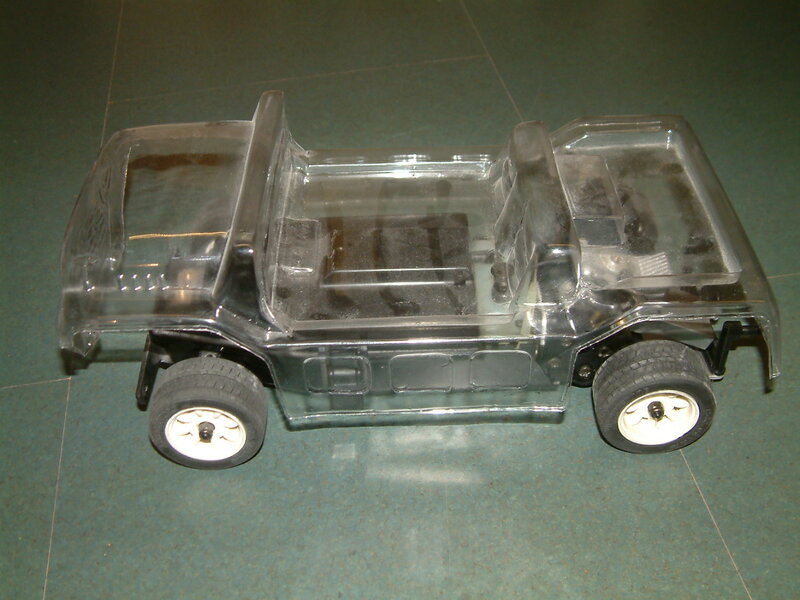 In a first step I will use the electric chassis and let the shell a bit higher to keep it without cutting. Comments and showing your RC Mokes are welcome! How about instead of shortening the shell, you lengthen the chassis? Walk in the park for someone like you Chris??? clm wrote: How about instead of shortening the shell, you lengthen the chassis? maybe I wrote not clear enough. It is not the length but the height of the chassis. I need to cut out a hole in the shell or just leave it higher in the the rear (like a hot rod). Hmm well in that case, why not get a bit of plate, fiberglass or aluminum maybe? 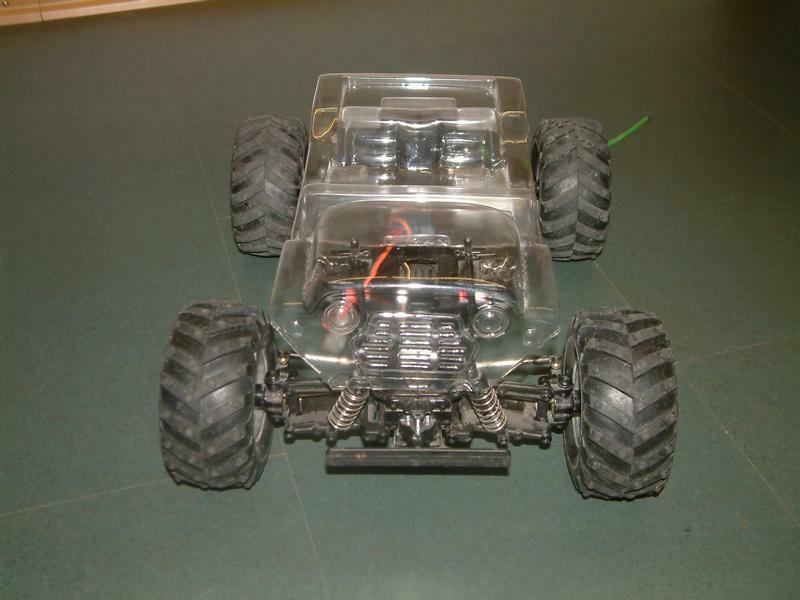 And make a flat plate chassis that the suspension components would mount to to reduce the height of the components? Should be easy enough to pull the components off and set them over a piece of thin cardboard to sketch out something that would connect them front to back? thatÂ´s what IÂ´m checking at the moment. I was already looking which suspension components are fitting best (just to leave the Mini complete) but havenÂ´t decided yet. Once again, many thanks for all your efforts to get the remaining shells. I've been hard at work on mine too and finally found a way to make it fit. I did have to cut a piece out of the shell, including Christoph's signature panel. I have kept it and am looking for ways to still incorporate it. The panel cut out is for the steering servo housing. I have some polycarbonate sheet so I may try to fashion a cover which will become the dash and mount for steering wheel. More pics in gallery. With witch tool you have cut out the Moke out the plastic ? Dremel ? Weske wrote: With witch tool you have cut out the Moke out the plastic ? Dremel ? I am now folding a cover for the servo housing. I will attach the CH2002 stamp to this and add a steering wheel and dashboard sticker. I may need to paint the cover from the outside if the creases stay white. 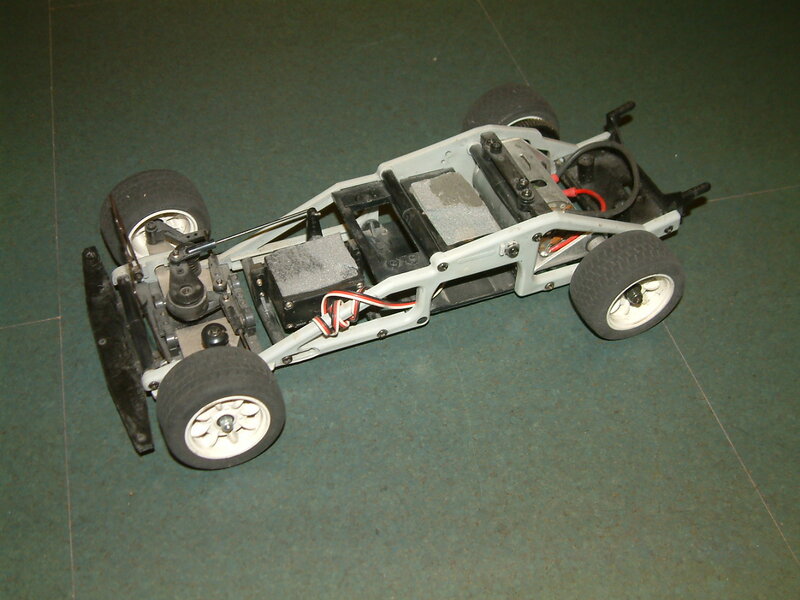 I have sorted my chassis, an M03 with 3Racing trick bits. I will sort some pictures, when I can. They look great... and can use them on your toenails when you're done cutting the Moke shell On a serious note - I used to have some very similar probably identical but more expensive actually as they came in a Tamiya bag at the time . Lost them a long time ago . They were the best. YOu might be able to tell me what's the best tool to cut small round holes with. I carefully used a soldering iron to cut the post holes - but I may fit some LEDs.... sort of looking for a leather punch or the like. Any ideas? thatÂ´s quite a large piece you had to cut out. IÂ´m still trying to avoid this and will accept a larger gap between rear wings and wheels. Next step is fitiing the upright arms and making the holes in the shell (thanks for your tip with the solder iron). So if you ever think of a monster Moke! Just a few very small problems! IÂ´m glad that I donÂ´t need MOT or TUEV (in Germany) for this project. I think you will be hard pressed to get the shell to fit nicely without cutting some of the shell away. I didn't want to cut that piece out either, but when you see the fit, it is almost made for it. 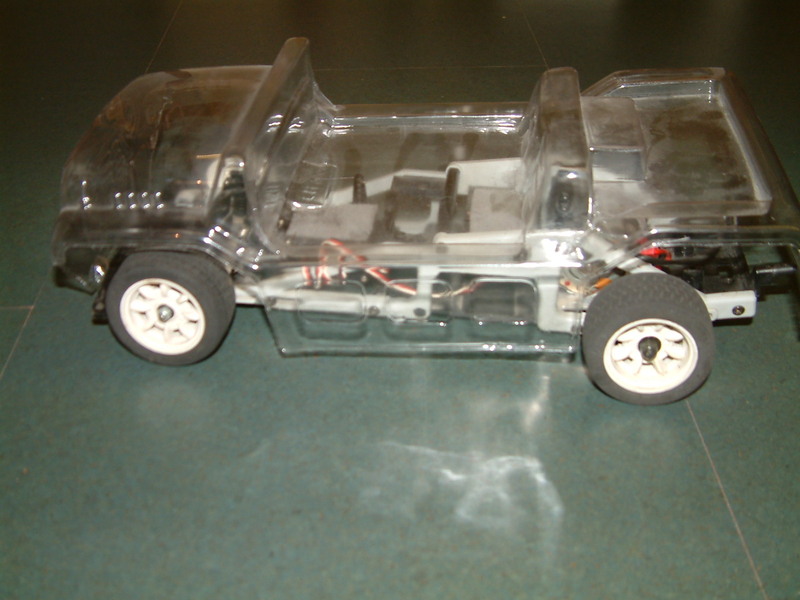 On the other hand, if you increase the shell height above the chassis, it wil be easier to fit the radio gear. I did play with all sorts of options, but it looked rubbish - especially as the shell is quite short. I have made a cover for the hole now and will probably cover it with some fabric or suitable finishing material to fashion a dashboard. At the moment it is held with gaffa tape - but it doesn't look too good close up. I have added the bumper mounts. I will find some rigid tubing (8mm will be good) tomorrow. Fitting the radio gear is really tough. There is virtually no space and the M03 chassis is quite narrow ant the back. I had to fit the ESC to the side of the chassis. I will make a guard out of some ally plate to protect it.